Nilla Pierrou has dedicated this third box with recordings, mostly live recordings from various radio archives, to her father, Ivar. He was a fine musician and a great inspiration for Nilla. Also two fellow violinists are mentioned in her booklet notes: Sven Karpe who was important for her development in the late 1950s and first half of the 1960s, and André Gertler, the Hungarian-born violinist and friend of Bela Bartók, who was her friend and mentor for 28 years. Those who already own either of, or both, her earlier boxes (review ~~ review) will need no recommendation from me. That said, the technical quality of the recordings and transfers is spotless, the documentation is extensive and spot-on and the booklet is lavishly illustrated with photographs. Those who have missed the previous boxes will probably be hooked from the very beginning of the new one, having savoured Nilla’s superior playing of Aulin’s Four Watercolours. These are among the most enjoyable small pieces for violin and piano in the whole repertoire – the young Mischa Elman was very fond of Aulin’s music, played the Lullaby throughout his career and Aulin dedicated his Barcarole Op. 16 to Elman. They can’t be better played than on these studio recordings from 1980, originally issued on the label Opus 3: the melting lyricism of Idyll with unsurpassable beauty of tone, the elegant lightness of Humoresque, the restrained inwardness of Lullaby and the rhythmical vitality of the concluding Reel, reeking of references to Swedish folk music fiddling. I have loved these pieces since I first bought an EP with Lars Frydén in the early 1960s, but nobody to my mind has played them better than Nilla Pierrou. These are just the beginning of almost four hours of high quality music, some of it not too well known, but all of it performed with the utmost conviction and brilliance. I could write at length about each and every piece but I prefer to touch more lightly on most of them. Those who prefer dipping into a collection of this kind more or less at random, should know that her Paganini has intensity and glow, that she and her admirable long-time piano partner Eugène De Canck negotiate the intricacies of Schönberg’s late Phantasy with abandon – takes some time to digest perhaps but repeated listening is rewarding. In Suk’s charming 4 pieces, almost exactly contemporaneous with the Aulin Watercolours she is accompanied by her older sister Eva. Here one can savour the melancholy sweetness of the middle section of Appassionato with marvellous legato-glow and superb double-stops, and the final section played with irresistible verve. Un poco trite may not sound too inviting and it is permeated with sadness but the warmth of the playing is soothing. The cat-and-mouse game of the Burleska can’t fail to make the listener smile. The violinist Antonio Brunetti, for whom Mozart was commissioned to write the little Rondo in C major, was according to Mozart’s letter to his father “raw, dirty and a disgrace to his employer” (the Archbishop Colloredo). In spite of this, and the frosty relations between Mozart and the Archbishop, Mozart wrote this charming piece. As is often pointed out, Mozart was no “diary-composer”. Whether Brunetti was as accomplished a player as Nilla Pierrou we will probably never know, but if he played the rondo as beautifully as she does, he was a great musician. The Hindemith sonata is a 20th century equivalent to the Bach sonatas and partitas and like those it calls for high technical ability from the player. As we already know, having so far listened to about one hour of the most scintillating violin playing imaginable, Hindemith poses no audible problems for Pierrou. The concluding prestissimo is a real tour de force. The F-A-E-sonata was a joint project for Robert Schumann, his pupil Albert Dietrich and Schumann’s young friend Johannes Brahms. It was a tribute to the masterly violinist Joseph Joachim and was composed in the autumn of 1853. The sonata was not published until after Brahms’s death but today this scherzo is part of the standard repertoire. Brahms’s three violin sonatas are all from the last twenty years of his life, among the most structurally perfect compositions in his total oeuvre. This scherzo, written when he was barely twenty, overflows with romantic passion and here is played with tremendous poise. This also traces its origins back to the Opus 3 record mentioned above. CD 2 pairs two 20th century concertos, almost contemporaneous but stylistically very different. Khachaturian’s works have not always been rated highly by some critics but audiences worldwide have taken several of them to their hearts. The violin concerto with its mix of Armenian folklore, virtuoso pandering to the public in the outer movements and beautiful melancholy in the central Andante sostenuto is arguably his most frequently heard composition. It was written in close collaboration with David Oistrakh who composed the cadenza for the first movement. He it was who premiered the concerto in 1940. The soloist has to toss off breakneck fireworks throughout the long first movement with practically no opportunities to relax. Though one knows there are hundreds of hours of rehearsal behind this it all sounds so easy and almost casual when Pierrou plays it. She then sings beautifully in the slow movement where she occasionally shares the limelight with some excellent woodwind soloists. The finale is also mostly virtuosic but in the middle section there is more Slavonic melancholy, where the violin plays movingly in the lowest register. Bartók’s second concerto – in his own opinion his only one – is an extremely vital work, rhythmically incisive and harmonically thrilling, with episodes of celestial beauty, including the divine central Andante tranquillo. Pierrou’s mentor André Gertler taught her a lot about how to interpret Bartók and in the booklet she gives several examples of what he said. One such observation is about Bartók’s metronome notations: “The idea is to respect the difference between e.g. 100’ in comparison with 60’ – not that you always need to play as fast as is noted.” With all this information in the backpack, Nilla Pierrou’s reading must be seen as utterly authoritative. The third disc opens with one of the all-time favourites in the concerto repertoire, Bruch’s No. 1 in G minor. I first got to know the slow movement in the 1950s when I heard it on the radio on Christmas Eve: “Santa Claus in the Gramophone Archive” was a recurring late evening programme and every year Bruch’s Adagio was played. I later found out, when I bought the LP recording (Wolfgang Schneiderhan), that the outer movements weren’t bad either. With due respect to Schneiderhan I must state that Nilla Pierrou isn’t an inch behind, either in beauty of tone or warmth of execution – two of Schneiderhan’s hallmarks. Talking of that Austrian master, whose centenary will be celebrated next year, he was the one who premiered the revised version of his friend Karl Amadeus Hartmann’s Concerto funebre in 1959. This is a deeply satisfying and moving work, probably Hartmann’s best known. I once bought a Supraphon LP where André Gertler played it with Hindemith’s violin concerto on the reverse. I haven’t heard it for ages anywhere which is a great pity and thus it is a real treat to have it in this box. The Adagio is utterly moving, played here with dark sincerity, the Allegro di molto is filled with pain and aggression and the concluding Choral is inwardly glowing. The Belgian Henri Vieuxtemps wrote no fewer than seven violin concertos of which number 5 is the most frequently heard today. It balances on the edge of the standard repertoire, very much thanks to the inclusion in the slow movement of a melody by Grétry, more precisely the quartet from his 1769 opera Lucile. This tune was also sung as an unofficial French national anthem between 1815 and 1830. Later we also find a Belgian connection: for many years it began and finished the daily broadcasts of Belgian Radio. It is lovingly played here: both the solo and the orchestra. By the way it should be pointed out that the orchestra is the then Falu Sinfonietta, later to become Dalasinfoniettan, a regional orchestra in the province of Dalarna (Dalecarlia), which during the last few years has reached international standard. Their latest CD with Norwegian violinist Henning Kraggerud as soloist was awarded the accolade Recording of the Year here at Musicweb International a couple of years ago – not by me I hasten to add, but by my Australian colleague David Barker, so there is no undue local patriotism from my side. 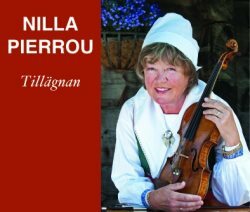 Once again we have to be enormously grateful to Nilla Pierrou for her indefatigable search for valuable recordings from the radio archives (mostly) and for Christer Eklund who has so lovingly transferred them to CD and produced this third proof that Nilla during more than thirty years was one of the foremost violinists in the world. She should rightly have been recording during that period for the prestige labels but these three boxes are worthy substitutes. My only problem when reviewing was actually to find suitable superlatives without repeating myself too frequently. Dear reader: whether you are Swedish, Australian or any other nationality, you will find unlimited pleasure for many years to come on these discs, full to bursting point. Not to be missed.